As an adult, trust is harder to build because you have lived and experienced heartache and deceit. The past is what is preventing you from taking a step into your future. And, yet, there is trust around us every day. We just fail to notice it. Every time I get into my car, I trust the person driving alongside me is: licensed; insured; capable; sober; not texting; following the law; and so on. When I go to a restaurant, I trust that: the chefs don’t give me chicken tar tare; they wash their hands; the bartender mixes the correct drink; I don’t get overcharged. There are tons of examples of trust surrounding us everyday in this world and yet, we are skeptical. You know who is not skeptical? Your child. That kid trusts you more than you can imagine. What you feed her. When you bathe her. Change her. Clothe her. Walk with her. Hold her. Give her a toy. Tell her no. Everything your child responds to – especially so young, like mine – is based on the trust she has in her parents. That light bulb flickered on for me a few weeks ago. All she knows is what we’ve provided for her. Whether it’s the right daycare, or the right temperature of a bottle, there is an amount of faith in a 30-pound human being that is unrealized by me. Slowly, as she ages, that trust will erode. I’ll break it somehow and I’ll lose a piece of the trust monument I spent years building. Plus, she’ll become a teenager and not trust anyone except for some friends who will end up backstabbing her and a romantic interest who won’t have her best interests at heart. It’s sad, but true. So in the meantime, all I can do is continue to build that trust with her. Because when that eventual letdown happens, I want her coming to me with the problems. Trusting I can help her solve them. 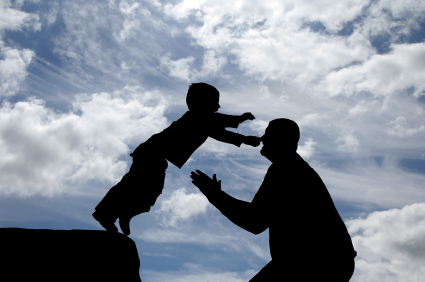 Yes, children trust and are completely dependent upon others. They rely on us their parents and others for their needs. It’s a big responsibility and a fulfilling one. Thanks for reading – I definitely agree on the responsibility. Soon I know the fulfilling aspect will pay off when she gets older.